Fear of gun legislation following the Sandy Hook School shooting drove U.S. demand for guns to absurd heights. It’s increasingly clear that laws won’t be tightened. Gunsmith Sturm Ruger is the first to admit the emotion that fired up the bottom line has run its course. The reckoning will be painful. The Connecticut-based maker of rifles, semi-automatics and pistols had fine results for the fourth quarter, with sales rising 28 percent from the same period last year. But the company said demand last year had been driven by “fear and uncertainty.” The Newtown massacre in December 2012 created the perception that stricter limits on ownership were coming, sparking prospective buyers to stockpile. The week following the shootings set a record for background checks – the best indicator of future sales. That barometer is now pointing in the opposite direction. There were 1.7 million background checks performed in January – a third fewer than in the same month a year ago. History suggests demand still has a long way to fall. Though lower than in the previous year, the number of gun checks in January was about double what had been typical in the years before the Obama presidency. Moreover, well-maintained firearms can last a lifetime, and the percentage of American homes owning a gun continues to decline. The investment community seems to judge this is a temporary blip. Though shares of Sturm Ruger and Smith & Wesson are both down about 15 percent this year, both stocks have still tripled over the past three years. 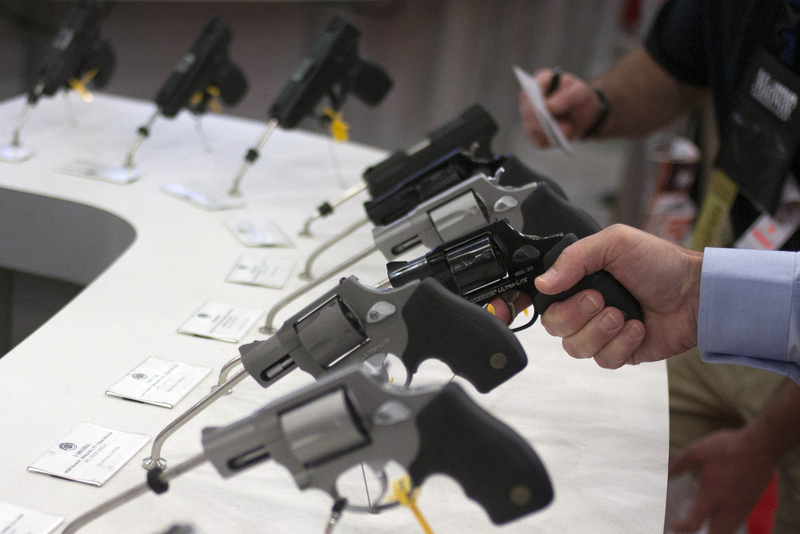 Sturm Ruger’s 2015 sales are still forecast by analysts to be higher than last year. Sturm Ruger seems less convinced. It has paid out about three-quarters of the cash it has earned over the past three years, through rising and special dividends. It just cut its dividend to 54 cents from 58 cents. A man holds a gun in the exhibit hall of the George R. Brown Convention Center, the site for the National Rifle Association's (NRA) annual meeting in Houston, Texas May 3, 2013. On Feb. 26, Sturm Ruger reported sales of $182 million for the fourth quarter. That’s a 28 percent increase from the same period last year. The gun maker warned, however, that orders were falling to more “realistic” levels, following emotional purchases in 2013 driven by political and legislative uncertainty. “Orders placed by retailers at distributors and those in 2013 were just through the roof. Absurd amounts. You would have a guy, for example, a retailer coming in who had a $25,000 credit line trying to place an order for $100 million of product. I mean, it was just silly. He knew he wasn’t going to get it. We certainly couldn’t fulfill it,” Chief Executive Michael Fifer told investors. Earlier this month, the chief executive of outdoor retailer Cabela’s said: “The surge in firearms and ammunition is clearly winding down,” and referred to last year’s demand for guns as a bubble.